Constitution and By-Laws. Art. 1. Name. This organization shall be known as the W.C.T.U. of Grinnell, Powesheik county Ninth district, auxiliary to the W.C.T.U. of Iowa. Art. 2 Object. The object of the organization shall be to interest and unite the women of this locality in temperance work for the reformation of the intemperate, the education of public sentiment in favor of total abstinence and prohibition and suppression of the traffic in intoxicating liquors. Membership. Art. 3. 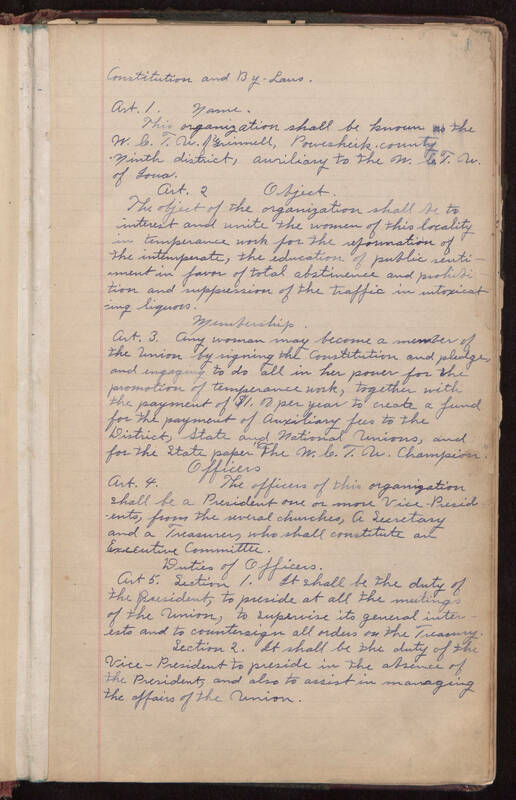 Any woman may become a member of the union by signing the constitution and pledge, and engaging to do all in her power for the promotion of temperance work, together with the payment of $1.00 per year to create a fund for the payment of auxiliary fees to the District, State and National Unions, and for the State paper "The W.C.T.U. Champion." Officers Art. 4 The officers of this organization shall be a President one or more Vice-Presidents, from the several churches, a Secretary and a Treasurer, who shall constitute an Executive Committee. Duties of Officers. Art 5. Section 1. It shall be the duty of the President, to preside at all the meetings of the Union, to supervise its general interests and to countersign all orders on the Treasury. Section 2. It shall be the duty of the Vice-President to preside in the absence of the President, and also to assist in managing the affairs of the Union.